It is folly, it is madness, to fill our wardrobes full of clothes and to regard the indifference a human being, a being made in the image and likeness of God, who is naked, trembling with cold and almost unable to stand. You say, “But that fellow there is pretending to tremble and not to have any strength.” So what? If that poor fellow is putting it on, he is doing it because he is trapped between his own wretchedness and your cruelty. Yes, you are cruel and guilty of inhumanity. You would not have opened your heart to his destitution without his play-acting. If it were not for necessity compelling him, why should be behave in such a humiliating way just to get a bit of bread? The made-up take of a beggar is evidence of your inhumanity. His prayers, his begging, his complaints, his tears, his wandering all day long round the city did not secure for him the smallest amount to live on. That perhaps is the reason why he thought of acting a part. But the shame and the blame for his made-up tale falls less on him than on you. He has in fact a right to be pitied, finding himself in such an abyss of destitution. You, on the other hand, deserve a thousand punishments for having brought him to such humiliation. John Chrysostom, On the First Letter to the Corinthians, 21, 5. I found this passage in today’s reading from Drinking from the Hidden Fountain: a Patristic Breviary. 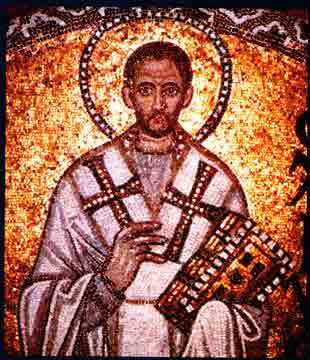 The passage is taken from St. John Chrysostom, the Archbishop of Constantinople who lived from around 347 through 407 A.D. He was a marvelous preacher and public speaker, who was given the nickname chrysostomos, meaning “golden mouthed.” He regularly spoke out against the abuse of authority by both political and church leaders. Because of this, he was arrested, exiled and banished several times. In today’s reading, St. Chrysostom criticizes our lack of charity, our lack of concern and love for the poor among us. He characterizes this as “madness.” He teaches that our treatment of the poor, our indifference toward them, reflects an indifference toward God. While our wardrobes are full, we ignore these images of God who are naked and shivering in the cold. Regarding the suggestion that the poor might be exaggerating their plight, Chrysostom turns that argument back on us. He suggests that the poor would not do so but for our cold-heartedness. (We still hear a related version of this suggestion today: that the poor do not merit our help because they are lazy or comfortable and have chosen their life.) St. Chrysostom responds that it’s unlikely that people voluntarily chose to surrender their dignity. More likely, he says, any exaggeration is simply meant to overcome our natural indifference. On occasion, I’m at the my church kind of late. Now and then, someone will come in asking for money. I have to admit that I sometimes confront a voice in my head that says, “You’re being played for a sucker here.” But I think St. Chrysostom would remind me that even if that’s true, that’s none of my affair. That’s between them and God. The choice before me, rather, is whether I want to overcome that skepticism with charity. I hope I’m willing to run the risk that, when I die, someone might write in my obituary that I sometimes loved foolishly. I hope you are willing to take that risk too. This entry was posted in Uncategorized and tagged Anglican, Bible, Disciple, Christianity, Church Fathers, discipleship, Dominican Order, Episcopalian, Love, Moral Theology, Pastoral Care, Religion, Scripture, Spirituality, St. John Chrysostom, Theology. Bookmark the permalink. oh what a wonderful and dear holy writing, thank you so much, my heart is so touched! I was just discussing the subject of giving money to beggars and panhandlers yesterday, actually. Generally, we were all sympathetic towards towards the situation of those people who ask for money. The conversation turned toward the issue of what they are going to spend the money on, do they really need it etc. St. John really cuts through to our hearts of stone! Wow. I SO wish I had written that sentence! Is it possible to covet a sentence? Well said, my brother! I simply love St. Chrysostom and have read of his exploits. His message is just as poignant today as it was then…it is funny how things never change. We think we are better off somehow in today’s society, that we have “evolved” as a people, that ancient texts don’t apply to our lives today, and that we are more connected than ever in the history of man. But quite the contrary, we are more connected in our disconnectedness. We still lack the orgainic nature of what Christ envisioned for us…He prayed and still prays for an organism, a living and breathing church, and not an organization that has an agenda. He searches the face of the earth for men and women who will serve Him (serve “the least of these”)…if we say we love God, but do not love (a verb…not an emotion) our brothers…we are a liar! I don’t want to be a liar. The apostle John makes this abundantly clear, and we should heed his advice and stop having merely an “opinion” on the matter! Ditto all the above comments. Great post. So I think Chrysostom goes a little far in suggestiing that its my fault that someone dropped out of school, or became a drug addict, or derived some mental illness that put them on the street. Still, I like your thought that we ought to take fault out of the equation and do what we can with the gifts that God has given to us. I am reminded of Pope Leo I who said that, in looking down upon the poor we are looking down upon Christ, for Christ, in taking on human nature, become one of us in every respect — therefore, no human, who shares the same nature as our King and God, is to be despised. I’m going to read more Chrysostom. I think we should adopt his thinking. I’ve read a rabbi’s blog on public sin which argued that by living in a society with opportunity biased against certain members, we are guilty for the bad schools, lack of decent jobs. I think it is better to err on the side of being too generous, though sadly, that’s not a “fault” of mine. I do feel like I might be a sucker if I give money to a beggar. I tend to give food, or if I have a gift card for a food establishment on me, I’ve given that. I’ve worked in some inner city schools, and they can be awful. I might have dropped out. I absolutely think the mentally ill deserve charity. I had to reblog this. It’s challenging and I think true. Thanks so much for the re-blog! Hope all is well with you. How very sad, but true. I believe that our love for our Lord will be displayed by a love for others. 43) I was a stranger, and ye took me not in: naked, and ye clothed me not: sick, and in prison, and ye visited me not. 44) Then shall they also answer him, saying, Lord, when saw we thee an hungred, or athirst, or a stranger, or naked, or sick, or in prison, and did not minister unto thee? 45) Then shall he answer them, saying, Verily I say unto you, Inasmuch as ye did [it] not to one of the least of these, ye did [it] not to me. 46) And these shall go away into everlasting punishment: but the righteous into life eternal. The reference to Matthew is spot-on. And yes, I think they will know we are Christians by our love. I find it mystifying that so many people would rather give to a wealthy TV evangelist than to a poor person or family who lives right next door to them. I wouldn’t qualify most of our religious leaders as being “the least of these” because “the least” to me implies lowliness and humility. There is something in us that has difficulty giving to the ones who need it most, a disconnect with humanity. I must read this book you’ve mentioned before- “Drinking from the Hidden Fountain.” Thanks for your studies and sharing with others. “The choice before me, rather, is whether I want to overcome that skepticism with charity. I hope I’m willing to run the risk that, when I die, someone might write in my obituary that I sometimes loved foolishly. ” Well said! What else are we here for if not to share the gifts God has given us already? Oh to be such a fool!